Whether you’ve had a your caravan for years and it’s seen your through many holidays and trips, or it’s a brand new addition yet to make its first outing, security is paramount. Due to the fact that caravans are highly mobile, the reality is that they can be easily moved or taken, so ensuring the security of your caravan is highly important and is something we take very seriously. From the secure and visible deterrent of wheel clamps, to the important business of keeping the caravan contents secure, we’ve got a wide range of caravan security accessories to make your caravan as secure as possible and to ensure your peace of mine. Providing a double security role, hitch locks protect your investment whether parked safely at home, or out on the road. Covering and securing the hitch handle, the hitch lock prevents release when attached to your vehicle, for peace of mind at rest stops and touring. 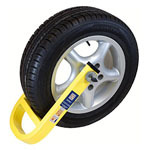 When parked, hitch posts can be used for permanent security or the included safety ball can be locked into the hitch to prevent attachment to a thief’s vehicle, stopping it from being towed away without your permission. Securing the caravan itself is only the beginning. For peace of mind at home and on site, fit the latest door catches and locks to keep your contents safe and keep unwanted guests from visiting. We offer the latest upgrades and replacement OEM barrels to replace damaged or worn locks. 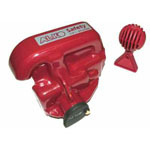 To secure your accessories we also carry a comprehensive range of padlocks and catches. 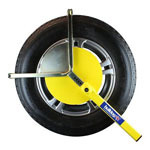 As one of the most popular wheel locks, the AL-KO secure locks are a high quality, affordable wheel lock that offer high levels of security and enhance the overall safety of your caravan. 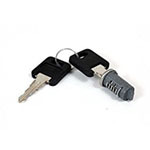 AL-KO secure wheels locks have been thoroughly tested to provide protection from drills and anti-pick mechanisms to ensure that the lock keeps your caravan safe. Milenco’s specialised high quality, durable and long-lasting wheel clamps offer a heightened level of security for your caravan. Having been vigorously trialled and tested, Milenco wheel clamps have been designed to be pick-proof and are made from a strong steel construction to resist sawing and freezing. Fully adjustable wheel clamps are highly versatile, ensuring that the clamp fits your wheel perfectly and are properly fitted to do their job properly. 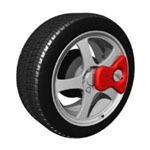 Stronghold wheel clamps cover all the wheel nuts and fit over alloy wheels as well as standard wheel trims.